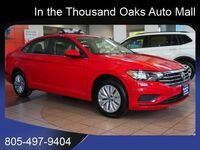 It can be difficult for drivers to choose between two great sedans, such as the 2019 Volkswagen Jetta vs the 2019 Toyota Corolla. However, drivers who look closely at both vehicles’ features and specifications will notice several significant differences. We’ve put together a comparison of these two sedans to help you decide between the 2019 Volkswagen Jetta vs the 2019 Toyota Corolla. Drivers who value performance should note the difference in power between the standard engine options found in both sedans. All 2019 Volkswagen Jetta models feature a turbocharged, 1.4-liter, four-cylinder engine with an output of 147 horsepower and 184 pound-feet of torque. In comparison, the 2019 Corolla’s standard engine is a 1.8-liter, four-cylinder engine which produces 132 horsepower and 128 pound-feet of torque. 184 ft-lbs. Standard Torque 128 ft-lbs. The 2019 Volkswagen Jetta has access to several features not found in the 2019 Toyota Corolla, including Apple CarPlay and Android Auto support. Both services are available as standard features in the 2019 Jetta, while the 2019 Corolla lacks support for either. Other notable 2019 Jetta interior features include a sound system with four speakers, Bluetooth connectivity, a USB port, an infotainment system with a 6.5-inch touchscreen interface and 16-inch alloy wheels. In terms of fuel economy, the 2019 Jetta is more efficient than the 2019 Corolla. The 2019 Jetta has a combined city/highway fuel efficiency rating of 34 miles per gallon, while the 2019 Corolla was rated for 32 miles per gallon in combined city/highway travel conditions. 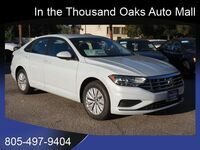 Standard 2019 Volkswagen Jetta comfort & convenience features include: Cruise control, front seatback storage, air conditioning, front and rear door pockets, a rearview camera, electric power steering, a tilt and telescopic steering wheel, and interior air filtration.